RÓISÍN O'SHEA Róisín O’Shea is an internationally published water-colour artist living in Waterford City, whose work has been published under license since 1993. She is a fine art graduate of the National College of Art and Design Dublin, and was awarded a postgraduate scholarship by the Australian government to study in Sydney, in the City Art Institute. On her return in 1987 O’ Shea was awarded tax exempt status for her work by the Irish State on the basis that her work has cultural and artistic merit. Over the years her work has been reproduced in many forms, including Fine Art prints, Calendars, books, greeting cards, place-mats, coasters, jigsaw puzzles, photo albums, collector’s plates and canvas prints. Her original paintings are in the corporate collections of AIB bank, the British Embassy, the Dutch Embassy, the Australian Embassy, and are in the private collections of two former U.S. Presidents George Bush Senior and Bill Clinton, ex US Ambassador to Ireland Jean Kennedy Smith, Academy award winner Brenda Fricker, broadcaster Pat Kenny, singer Chris de Burgh, Football legend Jack Charlton, U2 Tour Manager Denis Sheehan (RIP) and three former Irish Taoisigh. Her paintings were presented to H.R.H. Prince Charles, Queen Beatrice of the Netherlands and former Chancellor Helmut Kohl, by the British Embassy, the Irish Government and the German Embassy respectively. 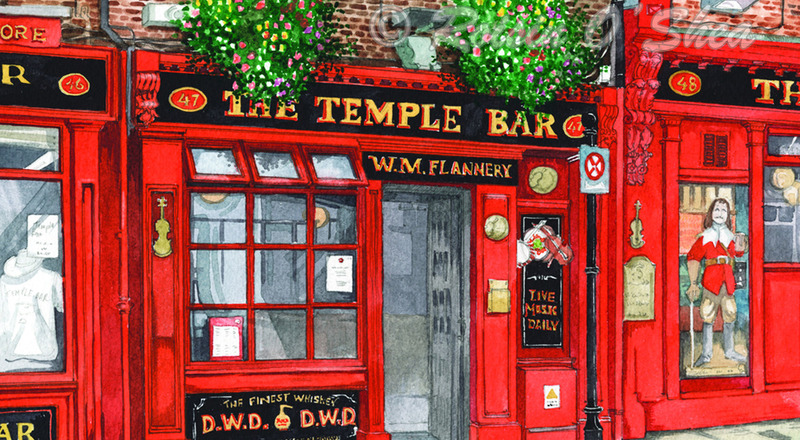 Her extensive collection of Irish watercolour scenes from the 32 counties, are published under license by Printcom, a Dublin based family printing business, and are also available through Carraig Donn outlets. Printcom produces high quality fine art prints, and other products, that are approved by the artist and are available to purchase on-line in our shop. Fine art prints, from the 32 counties of Ireland, 2017 catalogue, faithfully reproduced from the artist's watercolour paintings, available mounted in a single white mount 11" x 14" presented in an acetate sleeve, or an 11" x 14" framed print in a white mount and white frame. Large format Róisín O’Shea calendars, that can be over-printed with your logo. This is an ideal corporate gift, your company name appears on each month advertising your company 365 days of the year, minimum order apply. Large format fine art prints from the artist's catalogue, provided mounted or framed, minimum order applies. For further information please contact us on (01) 848 3422 or email bronwyn@printcom.ie to place your order.